First of all, “Perfect” is the second book in the duology (is that even a word?). If you want to find out more about the first book in the series, Flawed, you can check out my book review here. This is a brilliant sequel to the previous book, Flawed. Cecelia Ahern has once again really impressed me with her writing. Seriously, the woman knows how to build tension in a story. The way the characters grow as the story unfolds is great. Especially Celestine, the main character. You can see how much she has grown and matured from the start of the first book to the end of this one. The way she doesn’t trust people as easily as before, or how she thinks of a Plan B in case things go awry, shows how Celestine has learned from her past mistakes and sees things from another perspective now. There is a bit of a love triangle going on which might put some people off, but don’t worry, it doesn’t affect the flow of the story that much. The world building in this series is absolutely amazing! It seems credible and at times terrifying. To think that this concept of treating a certain group of people as second-class citizens (going as far as dehumanizing them) happens for real in some parts of the world (eg. Apartheid in South Africa, the Jewish/Black/Gay community in WW2, etc). The author paints a scarily real picture of a not-so-fictional society and makes us think about important issues, without being all in-your-face about it. Some people might think this should have easily been a trilogy with the amount of action that goes on in the story, but I’d rather have 2 action-packed books than 3 slow, dragged out books just to make it a trilogy (because apparently trilogies are very “in” right now). So kudos to Cecelia Ahern for giving us a fantastic story in just 2 books, instead of following the 3-book trend. 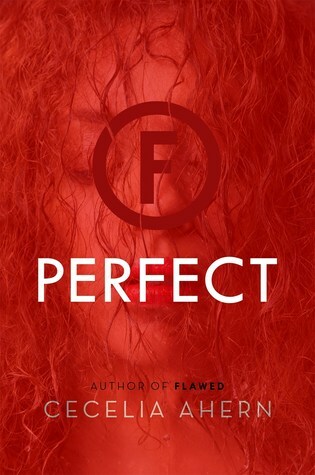 Perfect by Cecelia Ahern is a must-read for anyone who is into contemporay dystopian YA novels! But please read Flawed (the first book in the series) first! Lovely review! I heard about the first book, Flawed, a while ago, and I was curious to see what the author would do with a YA book. I read P.S I love you from her, and really enjoyed it. hehe totally get what you mean about goodreads system (give us half stars already! 😉 ) This sounds really good- and I completely agree with you- I’d rather have an action packed duology than a dragged out trilogy any day!! Right?! Hurray for duologies! Haha!